Our quarterly Pop-Up events give you a chance to see our artworks up close and personal; view the brushstrokes, colours, and textures, and explore details you just can't see through a screen. With them popping up every couple of months, there's always one around the corner so be sure to pencil us in. Coming Soon - Original Art Under $2K! Get excited for our Original Art Under $2K Pop-Up, opening soon on Thursday May 30. Back by popular demand, this pop-up gallery features a huge range of original art by our talented artists, all under $2,000. Your sure to find that special new piece for your home or office! Inspiration was on its way with our March Pop-up, encouraging visitors to dust off their blank walls and get a fresh start on 2019 with some bold new art. One of our most diverse Pop-ups to date, our gallery space looked fantastic decked out in fresh new art! Together for the first time, Art to Art and Forman Art and Framing presented ROWE... GOTO... MACILWAIN... a group exhibition featuring the works of Angie Goto, Sarah Rowe, and Melanie Macilwain. 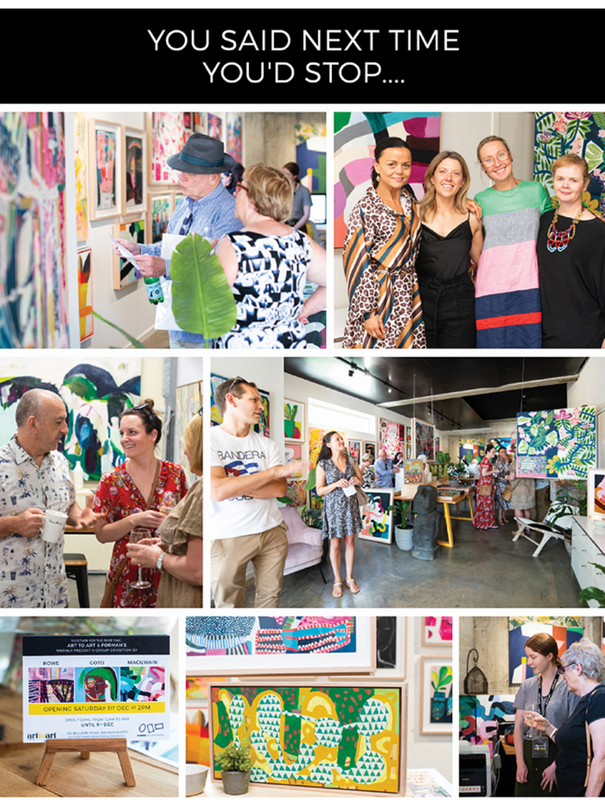 With artworks in all sizes, this pop-up was a riot of bright colours and exciting patterns, just in time for Summer! Thank you to everyone who stopped by and congratulations to the artists and everyone who found that amazing new piece for their home! 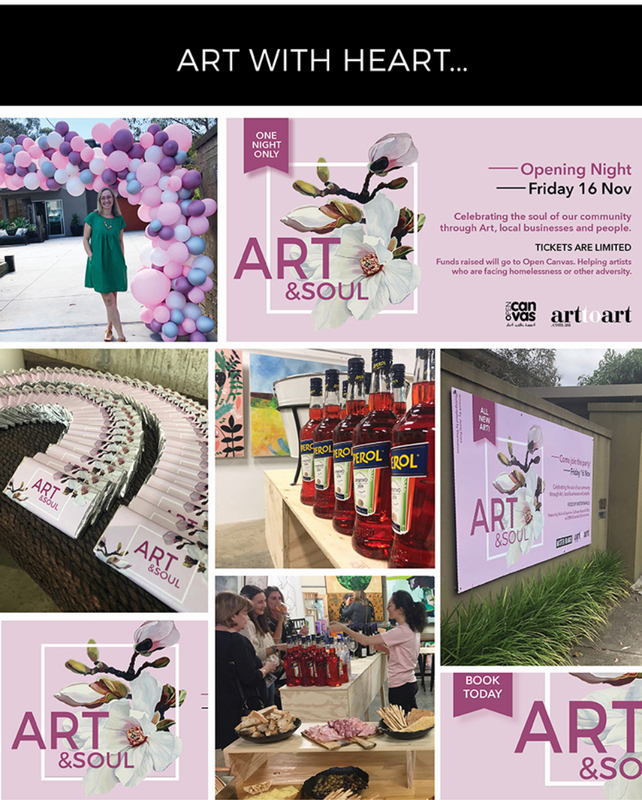 Raising money for Open Canvas, our Art & Soul Pop-Up Gallery opening night featured live music, local business and of course, wonderful large new artworks by amazing artists! Thanks to everyone who made it on the night and popped in the weeks following. With some incredible artworks by a big range of artists, the Art & Soul pop-up was one of our biggest! Keep your eyes open as some of these amazing artworks will start appearing on our site in the new year! Our latest pop-up in August featured a huge range of original art all under $2,000, from over 30 of our incredible artists, and was one of our most successful to date! Thank you to everyone who came along to our opening night or popped in over the last weeks. If you missed out don't worry! You can still catch many of these amazing artworks on our site. Our May Pop-Up Gallery featuring 10 new artists to Art to Art was a big success! We had a huge variety of exciting artworks from artists not seen before on Art to Art. Our Pop-Up may be closed for now, but if you missed out don't worry! You can still find many of our featured '10 New Artist' artworks available on our website. Check out our Opening Night here!